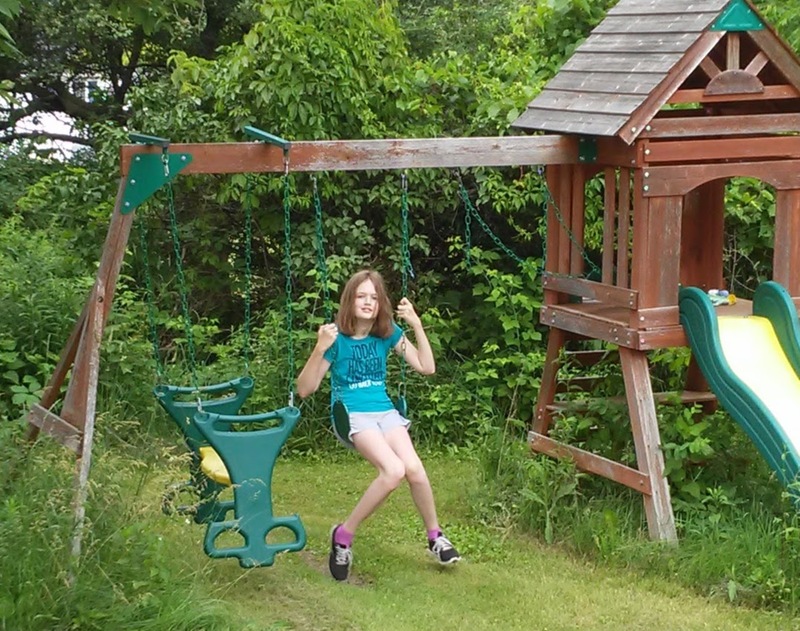 Jaycie on the swing set at my house. My youngest daughter Jaycie turns 11 today! Her favorite part about birthdays? The presents, of course! My favorite part about her birthday is that it marks the day when she came hiccupping and kicking out into the world and showed everyone her truly unique spirit. I can’t imagine my life without her and her older sister and I know I am so very blessed to have my girls! I’m picking Jaycie and her sister up later this morning and will have them both for half of the day before they go back to their father to celebrate with that side of the family. Jaycie wanted a Scooby-Doo theme for her decorations so I was up early this morning hanging decorations and streamers to celebrate her special day. I’m sure she’ll like them, but I know all she’ll really be thinking about today is opening presents! Jaycie’s favorite past time for a majority of her life has been swinging on a swing set. I still remember the first time she figured out how to do it by herself and it seems like she hasn’t stopped swinging since! She’s had physical and mental developmental delays her entire life and while that means she’s not like other “normal” kids her age, she’s never let it bother her. In fact, very little seems to bother Jaycie except maybe when her older sister tries to intentionally bug her. 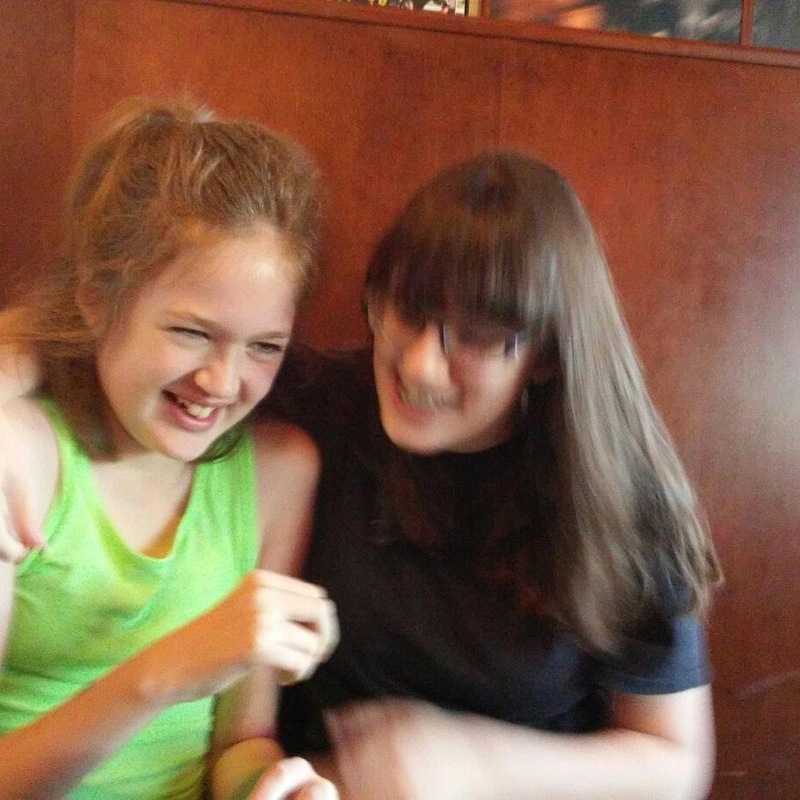 Jaycie getting tickled by her older sister. When Jaycie is outside swinging, she is the happiest kid in the world! She grins the entire time and periodically pauses to talk to our outside cat Owl or just chat about little made up adventures in her mind. She can literally spend an hour swinging and that just amazes me. She doesn’t get bored, she doesn’t get tired, and most times when she comes inside it’s because it got too hot out or she’s hungry. I think she finds great freedom in swinging because it’s an activity that involves motion but that isn’t slowed down by her lack of physical strength. As with every birthday my girls have, I can’t believe how much they’ve grown! I can’t believe Jaycie is 11 and going into sixth grade to start middle school this fall. As she’s already taller than me (I’m 5’5”) I imagine she’ll fit right in with the other middle school kids and no longer be one of the tallest kids in the hallway. Although it feels a bit odd to me that my youngest daughter is taller than me, I’m constantly encouraging her to stand up straight and love her height. There’s so much to see in the world and she’s lucky that she can see it from such a high vantage point!